"Lone Ranger meets Calamity Jane"
Of all the characters from the Old Western Frontier days, few are as obviously and utterly fictional than the Lone Ranger. The character was invented for juvenile listeners in Detroit, Michigan, by WXYZ station owner George Trendle and writer Fran Striker. Although the show targeted a young audience, at least half of its listeners were grownups, and it was so popular that it was picked up by Mutual and eventually the NBC Blue Network which would become ABC. The Lone Ranger as a character was fleshed out over nearly 3,000 radio episodes, newspaper comic strips, comic books, a series of Big Little books, novels, appearances on the Big and the Small screen, even video games. The Old West is more real to us in fiction than in history, thanks largely to Hollywood, and before that, pulp novels. Writers like Ned Buntline sold thousands, if not millions of words to publishers who made fortunes selling an image of the West and the Noble Cowboy in places like Boston and New York City. Characters like Rooster Cogburn, Matt Dillon and Chester Proudfoot, The Cisco Kid, Paladin, Ben Cartwright and his sons, Brett and Bart Maverick, Will Sonnet, Red Ryder, Josey Wales, and Jingles, Lucas McCain, Rowdy Yates, and Pecos Bill may have only existed in the media and our imaginations, but they could have been real people. 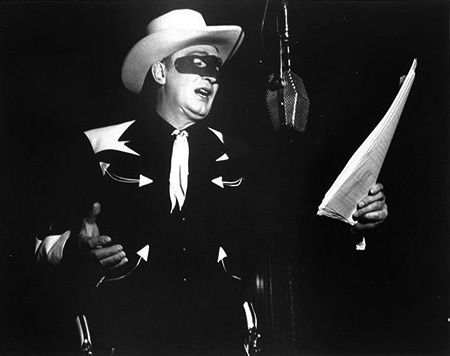 As a literary character, the Lone Ranger has less in common with those fictional heroes and seems more closely aligned with a costumed superhero from the comics. Like Batman and Superman, the Ranger slips between his costumed persona and the guise of a regular person. Superman is his true self in his tights, while Clark Kent is the disguise, and the Ranger has a similar attachment to his mask. Beyond his disguise, Batman does not have any real "powers" beyond physical toughness and extraordinary intelligence, the Lone Ranger adds an exceptional amount of luck to the formula. Although he is so obviously a fictional character, throughout his radio career the Lone Ranger encounters several historical figures. These encounters have the potential to besmirch the memory of persons who actually lived, and they certainly stretch plausibility simply by involving the Lone Ranger. However, in most cases, the memory of the historical figure is treated with respect bordering on reverence. The writers even manage to find nobility in a notorious thug like Billy the Kid without wandering too far from the known facts of the outlaw's case. More liberties are taken with Calamity Jane's story. Documented facts about Martha Jane Canary are few and far between, but it can be reliably supposed that her love affair with Wild Bill Hickok did not begin when the Ranger shot the guns out of her hands and she pretended to in the street, causing Hickok to give her a kiss. Bill Cody's uncanny abilities as a hunter and marksman are used in the story which culminates with Buffalo Bill getting into a scrap that prevents him from being at the side of General Custer at the Battle of the Little Big Horn. The Ranger's relationship with Cody expands when the Masked Man helps him start his Wild West Show by introducing him to Annie Oakley. With the exception of the Ranger's involvement and a robbery attempt on Buffalo Bill, the story sticks pretty close to the script of Annie Get Your Gun (1946, Imperial Theatre, 1,147 performances), although the broadcast was two years before the curtain went up on the play. The historical Kit Carson did act as a guide on the trail to New Mexico, but the story of him guiding the sister of a murdered shopkeeper to Santa Fe and encountering the killers on the trail is pure fantasy, even without the help of the Lone Ranger. One of the worst bad men in the history of the West was John Wesley Hardin, and his bloody rampage from Kansas to the Ro Grande is actually toned down on The Lone Ranger. On the show, young Hardin works for a while on John Selman Sr's ranch before stealing a horse and heading out to try and join John Selman Jr's outlaw gang. When Selman Jr. laughs Hardin away, the young killer begins a crime spree and eventually winds up back at Selman Sr's ranch where he guns down the old man in cold blood. Selman Jr. tracks Hardin to El Paso, with the Ranger and a US Marshall hot on their heels. Before the marshal can act, Selman Jr. kills Hardin in a gunfight and is arrested and jailed for his troubles. History records that the real John Selman Jr. was an El Paso lawman who arrested a prostitute friend of John Wesley Hardin's for brandishing a pistol. Hardin pistol whipped young Selman and was later confronted by Selman Sr., a known outlaw. The evening, Selman Sr. entered the Acme Saloon and shot John Wesley Hardin in the head. id The Lone Ranger meet Buffalo Bill, Calamity Jane, Annie Oakley, Billy the Kid, and more historical western figures? 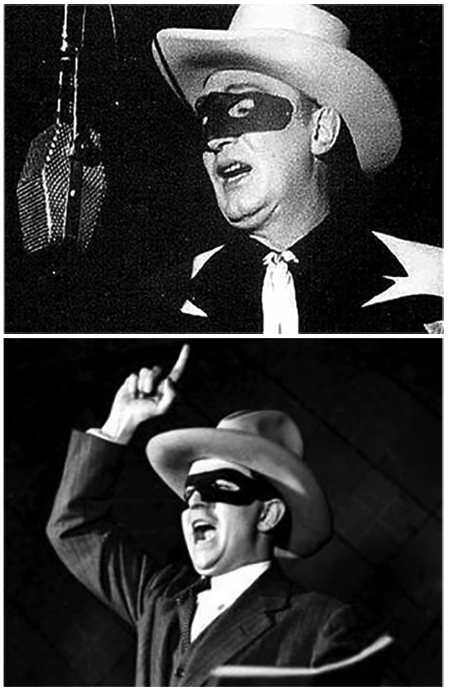 During the 1944 season of The Lone Ranger, our hero encountered real personalities of American Western history. In an excellent two-part Lone Ranger episode, The Lone Ranger is joined by Teddy Roosevelt and artist Frederic Remington to fight Butch Cassidy and his gang. Also included in this collection are four Gunsmoke old time radio episodes and one Frontier Gentlemen episode featuring historical western personalities. The Lone Ranger was one of the most eternally noble figures of the Old West, and his creators never let recorded and documented history get in the way of a good story. This collection is based on the research by Tim DeForest. For more about The Lone Ranger, Matt Dillon (Gunsmoke), and J.B. Kendall (Frontier Gentlemen) meeting historical personalities of the West, please see Tim DeForest's article: Lone Ranger: Adventures with Historical Western Figures in Old Time Radio. See also: The Lone Ranger and The Legion of the Black Arrow. Be the first to comment on "Western Adventures with Historical Figures"